Apostolides, A. (2013, May 3) ‘Beware of German Gifts Near Their Elections: How Cyprus Got Here and Why it is Currently More Out than in the Eurozone’. Available at DOI. org/10.2139/ssrn.2260222. Bryant, R. (2004, May 12) ‘An Ironic Result in Cyprus’. Middle East Report Online. Available at https://merip.org/2004/05/an-ironic-result-in-cyprus/. Cagaptay, S. (2004, April 29) UN Plan Fails in Cyprus: Implications for Turkey, the European Union and the United States. Washington, D.C.: The Washington Institute for Near East Policy. Available at https://www.washingtoninstitute.org/policy-analysis/view/un-plan-fails-incyprus-implications-for-turkey-the-european-union-and-the-. Casey, M. J. (2012) The Unfair Trade: How Our Broken Global Financial System Destroys the Middle Class, New York, NY: Crown Publishing. Christou, J. (2017, November 18) ‘North’s population tops 350 thousand’. Cyprus Mail Online, available at https://cyprus-mail.com/2017/11/28/norths-population-tops-350-thousan d/?hilite=%27population%27%2C%27north%27%2C%27has%27%2C%27reached%27 %2C%27351%27%2C%27000%27. Christodoulou, D. (1992) Inside the Cyprus Miracle: Labours of an Embattled Mini-Economy. Minneapolis: Modern Greek Studies, University of Minnesota. Christodoulou, D. (1995) Where the Miracle has not Reached [in Greek]. Nicosia: Intercollege Press. Deloy, C. (2004, April 24) ‘Failure of the referendum on the reunification of the Island’. Fondation Robert Schuman. Available at https://www.robert-schuman.eu/en/eem/0291failure-of-the-referendum-on-the-reunification-of-the-island. Djavit An, A. (2018, October) The Turkish Cypriot Community in Historical Perspective and the Changes in its Structure and Identity, Policy Paper 2/2018. Nicosia: Center for European and International Affairs. The Economist (1977) ‘Cyprus: Miracle in Half an Island’, Vol. 264, No. 6991: 50-51. The Economist (2014, August 23) ‘Calculating European GDP Changing the scales’. Economist. com. Available at https://www.economist.com/finance-and-economics/2014/08/23/ changing-the-scales. The Economist (2019, January 24) ‘Malta and Cyprus face growing pressure over money laundering’. Economist.com https://www.economist.com/europe/2019/01/26/malta-andcyprus-face-growing-pressure-over-money-laundering. European Commission (2017, November) ‘Making sun-blessed Cyprus a solar energy leader’. Available at http://ec.europa.eu/research/infocentre/article_en.cfm?id=/research/ headlines/news/article_17_11_21-7_en.html?infocentre&item=Infocentre&artid=46502. Feldstein, M. (1992, June 13) ‘The Case Against the EMU’. The Economist: 12-19. Feldstein, M. (1997, November/December) ‘EMU and International Conflict’. Foreign Affairs, Vol. 76, No. 6: 60-73. Feldstein, M., (1997, Fall) ‘The Political Economy of the European Economic and Monetary Union: Political Sources of an Economic Liability’. The Journal of Economic Perspectives, Vol. 11, No. 4: 23-42. Independent Commission on the Future of the Cyprus Banking Sector (2013, October) Final Report and Recommendations. Available at https://www.centralbank.cy/images/media/pdf/ LSE_ICFCBS_Final_Report_10_13.pdf. International Crisis Group (2006, March 8) The Cyprus Stalemate: What Next?, Europe Report No. 171.
International Monetary Fund (IMF) (2013, March) Cyprus: Options for Short-Term Expenditure Rationalization. Available at https://publicintelligence.net/imf-cyprus-expenditurerationalization/. International Renewable Energy Agency (IRENA) (2015, January) Renewable Energy Roadmap for the Republic of Cyprus Summary for Policy Makers. Available at http://www.mcit.gov.cy/ mcit/energyse.nsf/C1028A7B5996CA7DC22580E2002621E3/$file/IRENA_Cyprus_ Roadmap_Booklet_2015.pdf. Ioannides, Ch. (1991) In Turkey’s Image: The Transformation of Occupied Cyprus into a Turkish Province. New Rochelle, NY: Caratzas. Ioannou, C. and Emilianides, A. (2013) ‘How and Why Cyprus was shaken by the Crisis: The Real Causes’ [in Greek]. Foreign Affairs: The Hellenic Edition, Vol. 12: 41-51. Kathimerini (2010, February 15) ‘A. Neofytou: C. Stavrakis should apologize to the citizens’ [in Greek]. Kathimerini.com.cy. Available at http://www.kathimerini.com.cy/ gr/14525/?ctype=ar. Mullen, F., Oğuz, O. and Kyriacou, P. (2008) The Day After: Commercial Opportunities Following a Solution to the Cyprus Problem. Nicosia: PRIO Cyprus Centre. Orphanides, A. (2013) ‘What happened in Cyprus’, SAFE Policy Letter, No. 6, Goethe University. Available at http://nbn-resolving.de/urn:nbn:de:hebis:30:3-294834. Pelagidis, Th. (2014, June) Greece: From Exit to Recovery? Washington, D. C.: Brookings Institution Press. Phileleftheros (2019, January 21) ‘Stable salaries, rising rents’, Phileleftheros: 8. Phileleftheros (2018, November 18) Interview with J. Dijsselbloem. Phileleftheros (Financial section). Polyviou, P. (2011, September 30) Report of Single Member Commission of Investigation on the explosion that occurred at the Naval Base ‘Evangelos Florakis’ in Mari on July 11, 2011. Nicosia, Cyprus. Psyllides, G. (2016, April) ‘Cyprus a success story, EIB president says’. Cyprus Mail.com. Available at https://cyprus-mail.com/2016/04/08/cyprus-a-success-story-eib-president-says/. Rettman, A. (2013, May 20) ‘Leaked report damns Cyprus on money laundering’, Eurobserver. com. Available at https://euobserver.com/economic/120167. Sachs, S. (2004, April 25) ‘Greek Cypriots Reject a U.N. Peace Plan’. The New York Times.com. Available at https://www.nytimes.com/2004/04/25/world/greek-cypriots-reject-a-unpeace-plan.html. Sakellaropoulos, S. (2017) Cyprus Social Formation 1191-2004: From construction to partition [in Greek]. Athens: Topos Press. Statement of the Minister of Transport, Communications and Works for the approval of the bill for the establishment of a Deputy Ministry for Shipping, Deputy Ministry of Shipping, 14 July 2017. Available at http://www.dms.gov.cy/dms/dms.nsf/All/ D8CEAE7A43A1CBE6C225816B003FD335?OpenDocument. Statista-The Statistics Portal. (2019) Bank non-performing loans (NPL) to total gross loans ratio in Cyprus from 2009 to 2017. Available at https://www.statista.com/statistics/460814/nonperforming-bank-loans-in-cyprus. Stiglitz, J. E. (2016) The Euro: How a Common Currency Threatens the Future of Europe. New York, NY: W.W. Norton. Stockwatch (n.d.) ‘A Historical Overview of the Economic Crisis: October 2008 – February 2013’ [in Greek], Part 1. Available at https://stockwatch.com.cy/search. ?gq=χρονικό%20 εξελίκεων%20οικομικής%20κρίσης. Theophanous, A. (1991) ‘Economic Growth and Development in Cyprus 1960-1984’, Modern Greek Studies Yearbook, Vol. 7: 105-132. Theophanous, A. (2004) The Cyprus Question: The Challenge and the Promise, Intercollege Press, Nicosia. Theophanous, A. (2008) The Political Economy of a Cyprus Settlement: The Examination of Four Scenaria. Oslo: International Peace Research Institute (PRIO). Theophanous, A. (2014, December 4) ‘Troika Fixes Fail: How to Fix the Troika’. Friends of Europe.org. Available at http://www.friendsofeurope.org/future-europe/troika-fixes-failfix-troika/. Theophanous, A. (2016) ‘Cyprus: From an Economic Miracle to a Systemic Collapse and its Aftermath’. In L. Briguglio (Ed. ), Small States and the European Union: Economic Perspectives, London: Routledge: 28-49. Theophanous, A. (2016) Governance and the Political Economy of a Federal Cyprus [in Greek], Athens: I. Sideris Press. Theophanous, A. (2017, October) The importance of turning Cyprus into a regional academic and research centre after the economic crisis, Policy Paper 4/2017, Nicosia: Cyprus Center for European and International Affairs. Theophanous, A. (2017) ‘Revisiting the Cyprus Question and the Way Forward’, Turkish Policy Quarterly, Vol. 15, No. 4, Winter Issue. 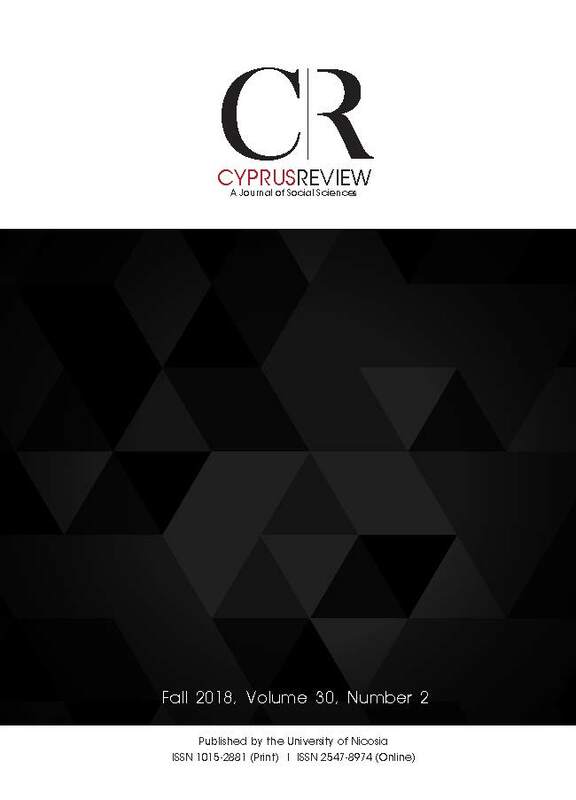 Available at http://turkishpolicy.com/article/841/ revisiting-the-cyprus-question-and-the-way-forward. Theophanous, A. (2018, November) The Eurozone Crisis and the Future of the EU, Eastern Mediterranean Policy Notes, No. 32. Nicosia: Cyprus Center for European and International Affairs. Theophanous, A. and Sakadaki, A. (2015, October) The Economic Crisis and the Demographic Challenges [in Greek], Policy Paper 6/2015, Nicosia: Center for European and International Affairs. United Nations (2002, 2003, 2004) Annan Plan, 2002, I, II, 2003, III, 2004, V. Available at http://www.un.org/Depts/dpa/annanplan/annanplan.pdf. Vaughan-Whitehead D. (ed.) (2016) Europe’s Disappearing Middle Class? Evidence from the World of Work. Chelteham: Edward Elgar Publishing.